We offer 5X5 indoor rooms with a 5X10 connected outdoor space. Each dog is in his or her private room they cannot see the boarder next to them. We also have 4 kennels that are open for dogs from the same family that feel more comfortable being close to each other. We supply Kuranda elevated beds for each pet. The facility is heated and air conditioned with lots of windows for natural light. Our kennel also has a large (60X60) grassy fenced area for plenty of play time. We are always happy to give a tours of our facility. 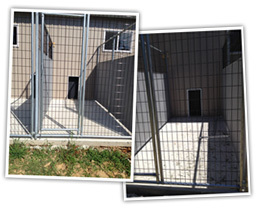 We live on the premises so you know your pet will always be safe.